This article was previously presented as an educational exhibit at RSNA 2008. Treatment varies with a malignancy’s pathologic variant, anatomic location, and the patient’s physical status. Focal lesions may be treated with radiotherapy, surgery, or neo-adjuvant therapy consisting of preoperative chemotherapy or radiation. More extensive lesions may undergo significant surgical resection and reconstruction to alleviate pain or maintain the patient’s functionality. The intent of the resection may be curative or palliative. Oncologic tenets may necessitate a surgical resection that complicates reconstructive effects to obtain a successful limb-salvage procedure. 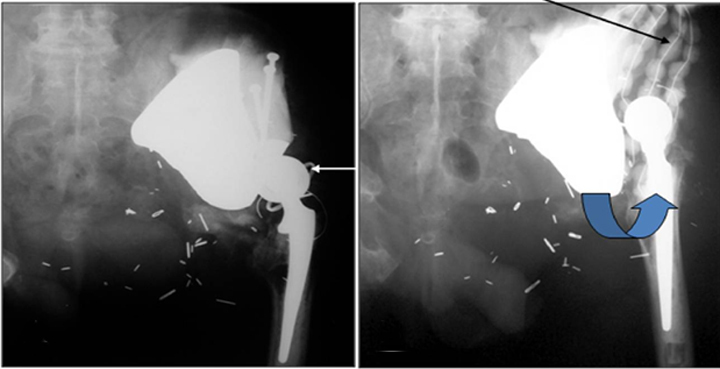 The purpose of this article is to provide an understanding of the indications, treatment methods, and complications of saddle endoprostheses, which are used for pelvic reconstruction after tumor resection. Topics highlighted include pelvic resection classification, surgical resection techniques, pelvic reconstruction saddle prosthesis types, and postoperative imaging, including signs of complications. In 1978, Enneking and Dunham6 classified pelvic resection margins into 3 main types (Figure 2). Type I resections are confined to the ilium (Figure 3), type II resections are confined to the periacetabulum, and type III are confined to the pubis (Figure 4). Of these, types I and III do not require acetabular resection, thereby maintaining pelvic stability and forgoing the need for prosthesis placement. 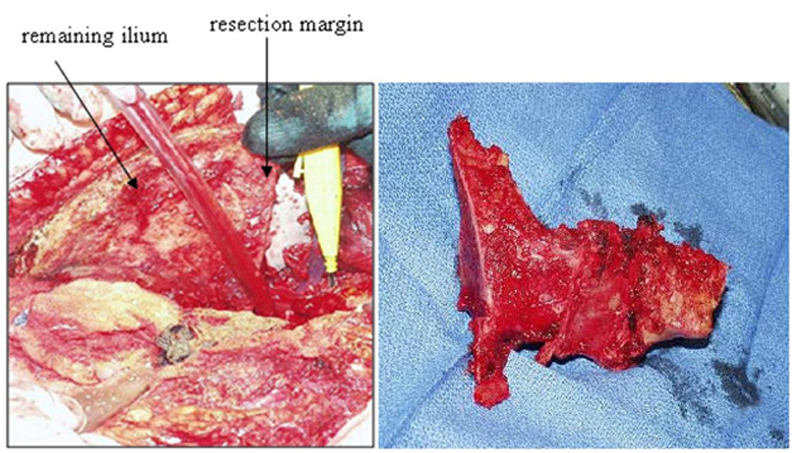 Type II resection provides the option of limb-sparing surgery or hind-quarter amputation (external hemipelvectomy). Crossover of pelvic resection types is common and resections are classified as such. For example, a resection involving both the acetabulum and the iliac wing is referred to as a type I/II pelvic resection (Figure 5). Lesions also can cross zones and still be treated with a single resection type. This is usually the case with large metastatic lesions, in which the objective is palliation. In this iteration of the saddle prosthesis, the ilium is sandwiched between larger, wider plates. The increased width allows greater latitude in the level of iliac resection. A captured polyethylene liner is also placed between the plates and the iliac wing remnant to compensate for the resectioning of soft tissue and to reduce the chances of the saddle component dislocating from the iliac wing remnant. Contraindications to saddle-prosthesis placement include recurrence following a previous limb-sparing procedure, unless the lesion can be entirely resected; extension through the sacroiliac joint with involvement of sacral nerve roots and foramina; and extensive soft-tissue infiltration, including tumor encasement of a neurovascular bundle.8,20-23,25 Osteoporosis is a relative contraindication. The diagnosis of these contraindications relies upon preoperative imaging studies and specific surgical considerations. The patient is placed in the lateral decubitus position and the pelvis is accessed via the extended iliofemoral approach to allow access to both the anterior and posterior hip. Mean operative time is 7 hours due to the complex anatomy as well as efforts to preserve neurovascular and visceral structures within the operative field. Blood loss can range from 450 ml to 5000 ml. The amount of native iliac bone stock for placement of the prosthesis varies with surgeon preference. The PAR prosthesis requires more native bone stock than does the traditional saddle prosthesis, in order to accommodate the larger wings. At our institution, 2 cm to 4 cm of native bone stock is preferred. In some instances, the region may need additional bone graft and screw fixation for stability. The margins of the osteotomy depend on the number, size, and location of the lesions, as well as on the type of neoplastic disease (Figure 8). In primary neoplastic disease, wide margins can be curative. The oncologic orthopedic surgeons at our institution use margins of at least 1 cm of normal tissue, with a range of 1 cm to 5 cm. Margins are less essential in metastatic disease, as the objective in most of these cases is palliation rather than cure. 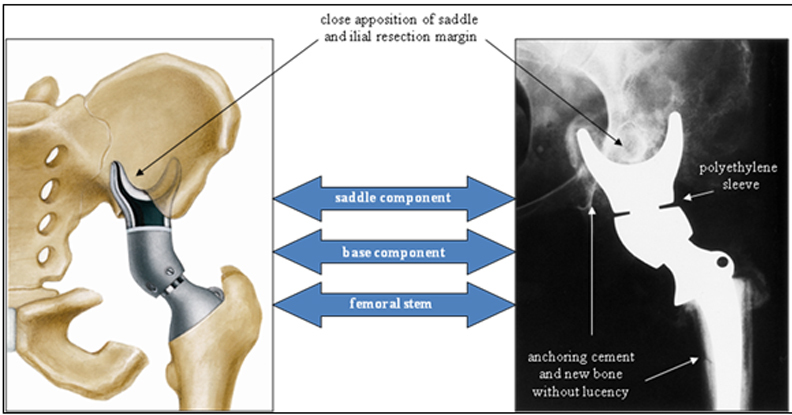 Once the ilium is satisfactorily resected, a notch must be made along the resection margin to permit fitting of the saddle (Figure 9). Our surgeons prefer to make this notch along the thickest part of the remaining ilium. Improper location and preparation can lead to prosthesis instability. The Mark II prosthesis articulates with the ilium without screw fixation. The intent is to allow some movement at the prosthesis and iliac margin interface for increased functionality. Some authors claim that this saddle-notch articulation can cause pressure erosions, superior saddle migration, and premature failure. Menendez et al claim that their custom saddle prosthesis (PAR) is less likely to move, as it is fixed with 3 screws. For added stability, some surgeons place a Gore-Tex artificial ligament (Gore Medical, Flagstaff, AZ) around the Mark II saddle near the completion of the procedure. 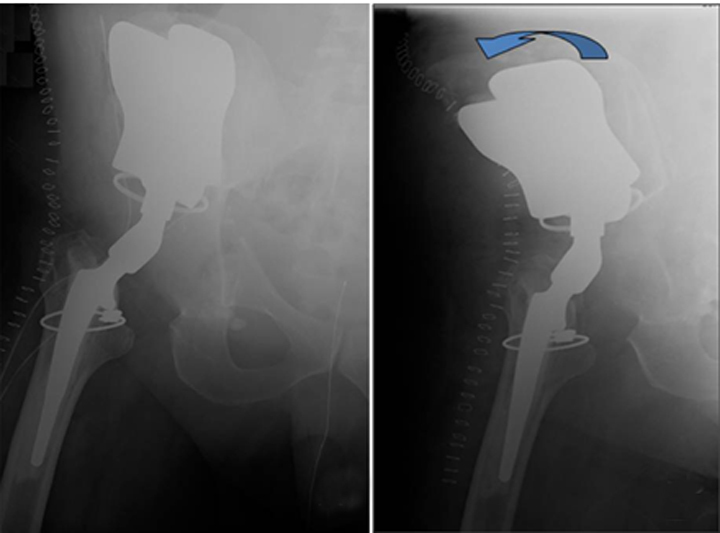 The PAR saddle prosthesis is affixed to the ilium with 3 screws and is believed to be less likely to migrate. Soft-tissue tension consists of the tendinous attachments of the psoas and the abductors, and it has been found to be critical for postoperative stability. To help preserve the native mechanical forces in the hip, involved muscles are sutured directly to the distal residual bone. Intraoperative evaluation consisting of range of motion, saddle stability, and ease of dislocation is then performed. A modular intermediate component allows for patient variability to maintain the soft-tissue tension (Figure 10). At our institution, additional measures are taken in placing the PAR saddle prosthesis. The space posterior to the prosthesis is packed with a sterile, absorbable gelatin sponge (Gelfoam, Pfizer, New York, NY). 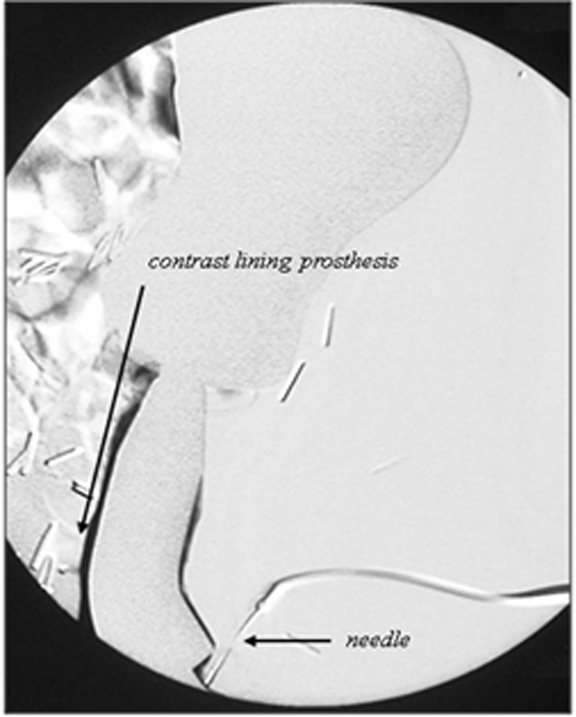 The space between the prosthesis and the ilium is packed with polymethylmethacrylate (PMMA). The femoral component is implanted, as in a total hip replacement. Modular components are placed as needed to maintain anatomic length and promote mechanical stability. These measures have significantly reduced postoperative loosening and migration compared to other prostheses and surgical methods. Intraoperative and postoperative conventional anteroposterior (AP) and lateral radiographs are used to demonstrate prosthesis placement. In some cases, additional obturator, oblique (Judet), and alar views help to visualize saddle placement and the interfaces between the prosthesis components and the bone (Figure 11). Our suggested conventional radiographic technique for evaluating saddle positioning consists of AP standing pelvis, as well as AP and frog-leg lateral views of the femur. Oblique (Judet) views of the pelvis are optional. A fluoroscopy-guided oblique film of the pelvis helps to profile the interface of saddle and bone. We have termed this an “interface view.” Under fluoroscopic guidance, the patient is obliqued to a position optimized to demonstrate the prosthesis-ilium interface. The patient is secured in this position with pillows, and an overhead radiograph is then obtained. This provides more detail than a fluoroscopic spot image and also avoids streak artifacts associated with CT. In some cases, CT imaging may be needed to assess saddle apposition to the ilium and its relation to intrapelvic structures. Streak artifact may make interpretation difficult, thus positioning and technique are essential. Magnetic resonance imaging (MRI) may be difficult to interpret due to signal loss from artifact. Indications for MRI include evaluating recurrence of tumor or complications, such as infection. Our preferred protocol consists of axial and coronal T1-weighted and short tau inversion recovery (STIR) sequences. Chemical shift fat-saturation techniques are generally avoided, as they are more vulnerable to field inhomogeneities related to the metallic hardware. Postcontrast T1-weighted sequences following the intravenous administration of a gadolinium-based agent can be helpful to demonstrate soft-tissue enhancement, which may indicate recurrent or residual tumor in areas not obscured by artifact. 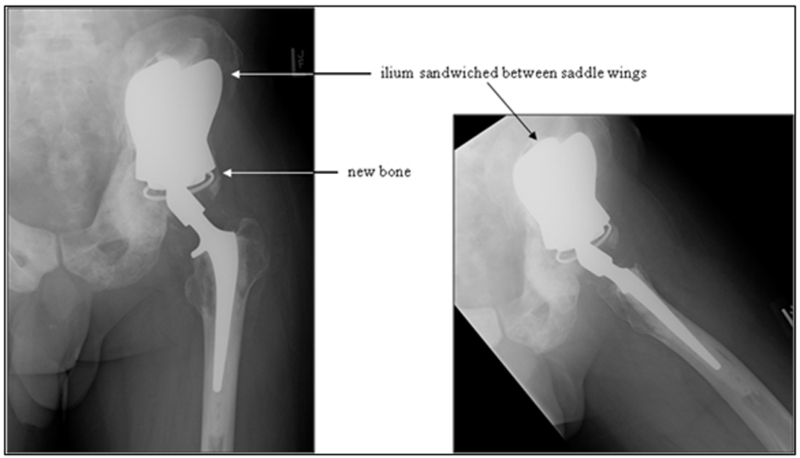 Postoperative evaluation of a saddle prosthesis is much like that of any implanted hardware. The alignment, position, and apposition of the prosthesis to adjacent cement and bone are important to observe and report. Close apposition of the saddle and adjacent iliac resection margin, as well as the femoral stem and adjacent residual femoral cortex, are essential to identify. Component alignment with respect to bone, as well as to each other, is also important to evaluate (Figures 11 and 12). 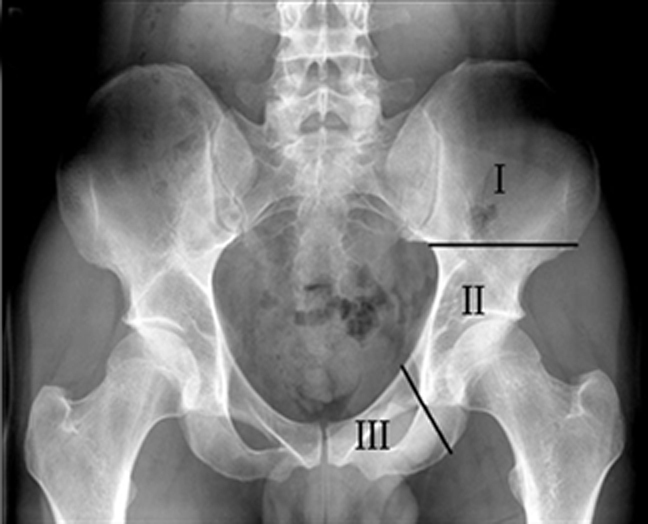 Cephalad migration, also referred to as “bedding in,” is quite common with the Mark I and Mark II prostheses (Figure 13).19 Upward migration is best evaluated on successive films by measuring the distance between the base of the intermediate component and a straight-line tangential to the inferior border of the sacroiliac joints.19 Sclerosis at the saddle-iliac interface is common. If no sclerosis is noted, increased cranial migration can occur. Significant or sudden changes in the rate of migration may indicate infection (Figures 14 and 15). Dislocation can occur between the ilium and the saddle component, as well as between the components themselves (Figures16 and 17).20 Subtle changes in angulation may signal impending dislocation. Cephalad migration or dislocation may call for MRI to evaluate for possible nerve injury, especially to the femoral and sciatic nerves. Evidence of recurrent primary or metastatic osseous disease should also be evaluated. Interval occurrence or progression of abnormal mineralization may indicate recurrence or residual disease. Prosthesis displacement without identifiable cause on conventional radiography may also indicate recurrence. Cross-sectional imaging, such as CT or MRI, may better indicate recurrence and may also demonstrate a soft-tissue component (Figures 20 and 21). As previously noted, periacetabular resection and saddle prosthesis placement is a complex procedure that can involve a large anatomic region. Accordingly, recovery time varies and hospitalization can be quite long.31 One group reported a median postoperative hospital course of 6 weeks,8 while at our institution the median postoperative course is a bit shorter at 3 to 4 weeks. The patient can be immobilized in traction or abduction from 5 days to 2 weeks. Average time to ambulation varies from 8 days to 9 months with extensive physical therapy. Our oncologic orthopedists have observed an average time to ambulation of 3 weeks when the periacetabular reconstruction prosthesis is employed. Initially, most patients require a cane or walker; they ambulate with the Trendelenburg gait, in which the pelvis sags opposite the affected side during weight bearing on the affected side. Compensation is achieved by leaning the torso toward the affected side. In general, saddle prosthesis placement improves analgesia requirements, patient independence, and ambulation. Most patients are able to ambulate with a cane and achieve an improved quality of life. Osseous neoplastic disease, both primary and metastatic, can involve the pelvis. In cases for which surgical resection is elected and the periacetabular region is involved, a saddle prosthesis may allow limb-sparing surgery and preserve reasonable postoperative functionality, including improved postoperative functional status, decreased limb length discrepancy, and reduced analgesia requirements. 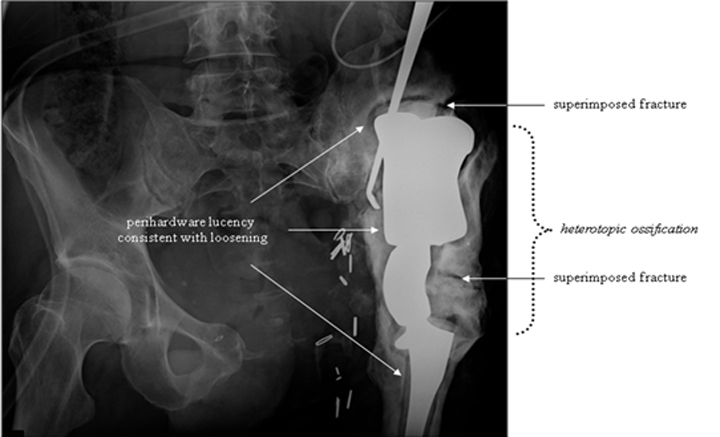 Understanding the radiographic appearance of a normal prosthesis and recognizing early imaging evidence of potential postoperative complications are important to reduce or prevent patient morbidity. Normal postoperative imaging should demonstrate close apposition of the saddle component to the segment of residual ilium. Postoperative complications, including saddle cephalad migration, saddle dislocation, fracture, and tumor recurrence, can occur. Continued refinement of prosthesis design and surgical technique will hopefully improve success rates and allow this technique to be applied to more patients with pelvic tumors. Frassica FJ, Sim, FH. Pathogenesis and prognosis. In: Sim FH, editor. Diagnosis and management of metastatic bone disease: A multidisciplinary approach. New York, NY: Raven Press; 1988;1-6. Yasko AW, Chow, W. Bone sarcomas. In: Padzur R, Coia LR, Hoskins WJ, Wagman LD, editor. Cancer management: A multidisciplinary approach. 10th ed. Darien, CT: CMPMedica; 2007. Saifuddin A, Abdus-Samee M, Mann C, et al. CT-guided diagnostic foot injections. Clin Radiol. 2005;60:191-195. doi: 10.1016/j.crad.2004.06.017. PubMed PMID 15664573. Dahlin DC, Coventry MB. Osteogenic sarcoma. A study of six hundred cases. J Bone Joint Surg. 1967;49:101-110. PubMed PMID 5225072. Weber K, Damron TA, Frassica FJ, et al. Malignant bone tumors. Instructional Course Lectures. 2008;57:673-688. PubMed PMID: 18399615. Enneking WF, Dunham WK. 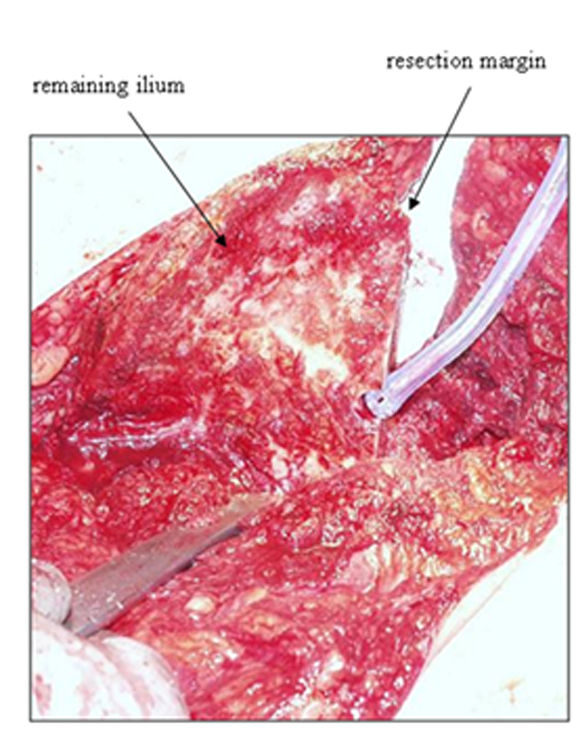 Resection and reconstruction for primary neoplasms involving the innominate bone. J Bone Joint Surg. 1978;60:731-746. PubMed PMID: 701308. Allan DG, Bell RS, Davis A, et al. Complex acetabular reconstruction for metastatic tumor. J arthroplasty. 1995;10:301-306. PubMed PMID: 7673908. Renard AJ, Veth RP, Schreuder HW, et al. The saddle prosthesis in pelvic primary and secondary musculoskeletal tumors: Functional results at several postoperative intervals. Arch Orthop Trauma Surg. 2000;120:188-194. PubMed PMID: 10738881. Muller PE, Durr HR, Wegener B, et al. Internal hemipelvectomy and reconstruction with a megaprosthesis. International Orthopaedics. 2002;267:76-79. PubMed PMID: 12078881. Fuchs B, O’Connor MI, Kaufman KR, et al. Iliofemoral arthrodesis and pseudarthrosis: A long-term functional outcome evaluation. Clin Orthop Related Res. 2002;29-35. PubMed PMID: 11953592. Windhager R, Karner J, Kutschera HP, et al. Limb salvage in periacetabular sarcomas: Review of 21 consecutive cases. Clin Orthop Related Res. 1996:265-276. PubMed PMID: 8895649. Zehr RJ, Enneking WF, Scarborough MT. Allograft-prosthesis composite versus megaprosthesis in proximal femoral reconstruction. Clin Orthop Related Res. 1996;322:207-223. PubMed PMID: 8542698. Donati D, Zavatta M, Gozzi E, et al. 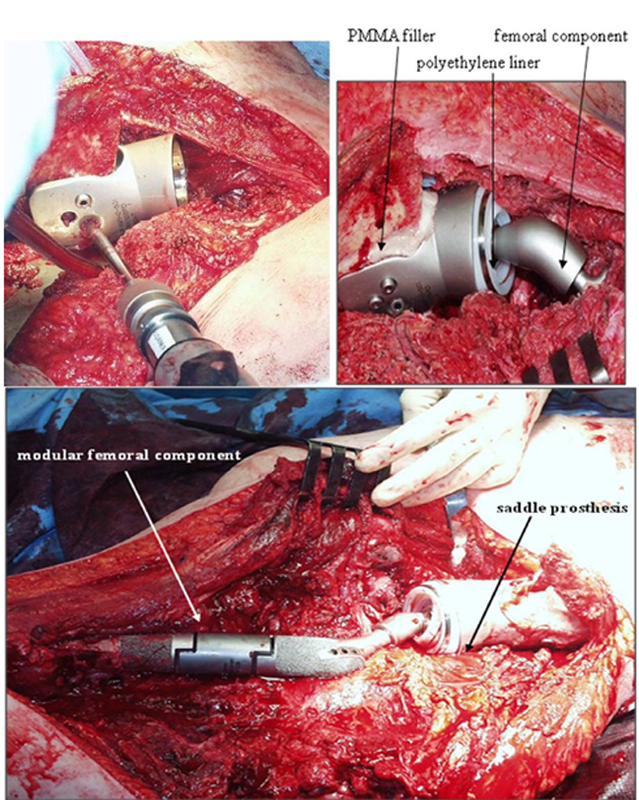 Modular prosthetic replacement of the proximal femur after resection of a bone tumour a long-term follow-up. J Bone Joint Surg Br. 2001;83:1156-1160. PubMed PMID: 11764431. Sharma S, Turcotte RE, Isler MH, et al. Experience with cemented large segment endoprostheses for tumors. Clin Orthop Related Res. 2007;459:54-59. PubMed PMID: 17545759. Torbert JT, Fox EJ, Hosalkar HS, et al. Endoprosthetic reconstructions: Results of long-term follow up of 139 patients. Clin Orthop Related Res. 2005;438:51-59. PubMed PMID: 16131869. Engelbrecht E, Heinert K, Nieder E. [Reflections on follow-up studies of hip and knee prostheses]. Der Chirurg; Zeitschrift fur alle Gebiete der operativen Medizen. 1983;54:221-225. PubMed PMID: 6851744. Nieder E, Engelbrecht E, Steinbrink K, et al. 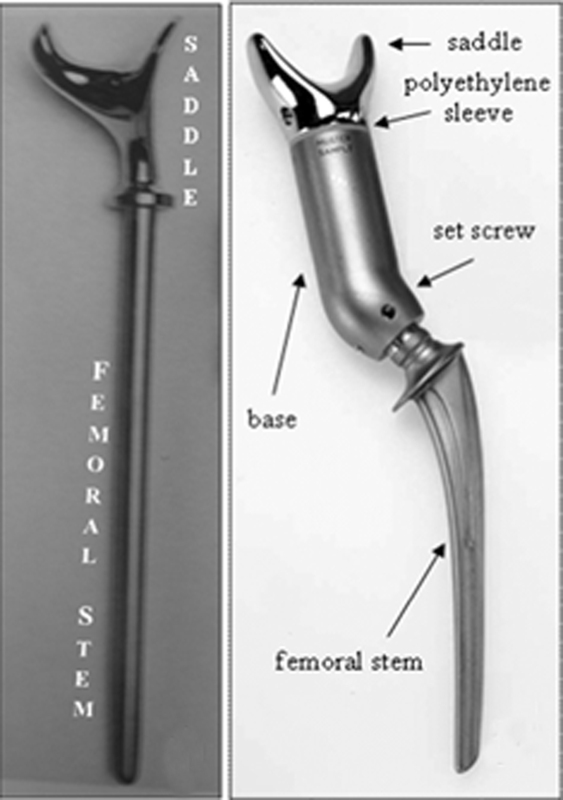 [Modular system for the total replacement of the femur—Endo-model]. Der Chirurg; Zeitschrift fur alle Gebiete der operativen Medizen. 1983;54:391-399. PubMed PMID: 6872646. 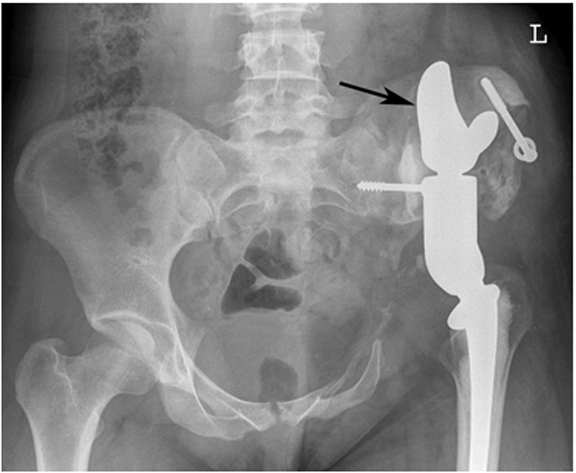 Otto K, Baars GW, Nieder E. [Pelvic bone defects in alloarthroplasty]. Der Orthopade. 1987;16:261-276. PubMed PMID: 3309791. Nieder E, Elson RA, Engelbrecht E, et al. The saddle prosthesis for salvage of the destroyed acetabulum. J Bone Joint Surg Br. 1990;72:1014-1022. PubMed PMID: 2246283. Aboulafia AJ, Buch R, Mathews J, et al. Reconstruction using the saddle prosthesis following excision of primary and metastatic periacetabular tumors. Clin Orthop Related Res. 1995;314:203-213. PubMed PMID: 7634637. Aljassir F, Beadel GP, Turcotte RE, et al. 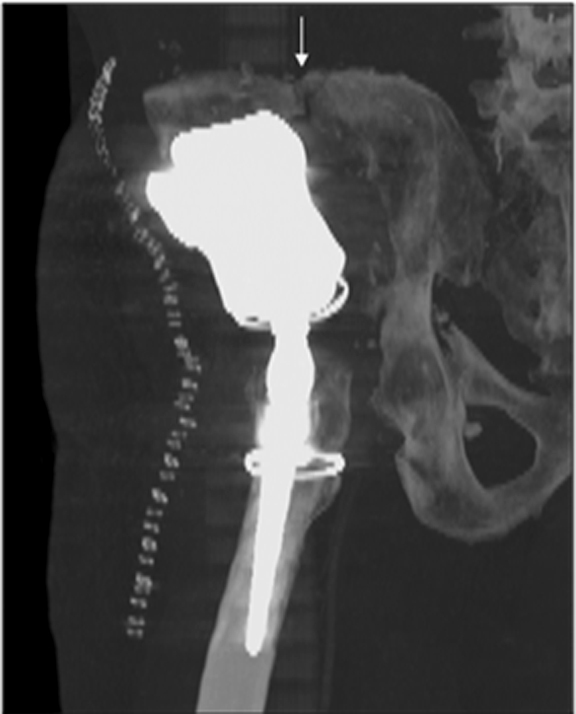 Outcome after pelvic sarcoma resection reconstructed with saddle prosthesis. Clin Orthop Related Res. 2005;438:36-41. PubMed PMID: 16131867. Cottias P, Jeanrot C, Vinh TS, et al. Complications and functional evaluation of 17 saddle prostheses for resection of periacetabular tumors. J Surg Oncol. 2001;78:90-100. PubMed PMID: 11579386. Kitagawa Y, Ek ET, Choong PF. Pelvic reconstruction using saddle prosthesis following limb salvage operation for periacetabular tumour. J Ortho Surg (Hong Kong). 2006;14:155-162. PubMed PMID: 16914780. Falkinstein Y, Ahlmann ER, Menendez LR. Reconstruction of type II pelvic resection with a new peri-acetabular reconstruction endoprosthesis. J Bone Joint Surg Br. 2008;90:371-376. PubMed PMID: 18310763. Rubert CK, Malawer MM, Rosenthal JL. Reconstruction with the saddle prosthesis: Indications, surgical technique, results. Semin Arthropastyl. 1999;10:171-179. Eustace S, Shah B, Mason M. Imaging orthopedic hardware with an emphasis on hip prostheses. Orthop Clin North Am. 1998;29:67-84. PubMed PMID: 9405778. Love C, Marwin SE, Palestro CJ. Nuclear medicine and the infected joint replacement. Semin Nucl Med. 2009;39:66-78. PubMed PMID: 19038601. Taljanovic MS, Jones MD, Hunter TB, et al. Joint arthroplasties and prostheses. Radiographics. 2003;23:1295-1314. PubMed PMID: 12975517. Nilsson OS, Persson PE. Heterotopic bone formation after joint replacement. Curr Opinion Rheumatol. 1999;11:127-131. PubMed PMID: 10319216. Stoltny T, Koczy B, Swiderski M, et al. Heterotopic ossification in patients after total hip replacement. Ortop, Traumatol, Rehabil. 2007;9:264-272. PubMed PMID: 17721424. Hoffmann C, Gosheger G, Gebert C, et al. 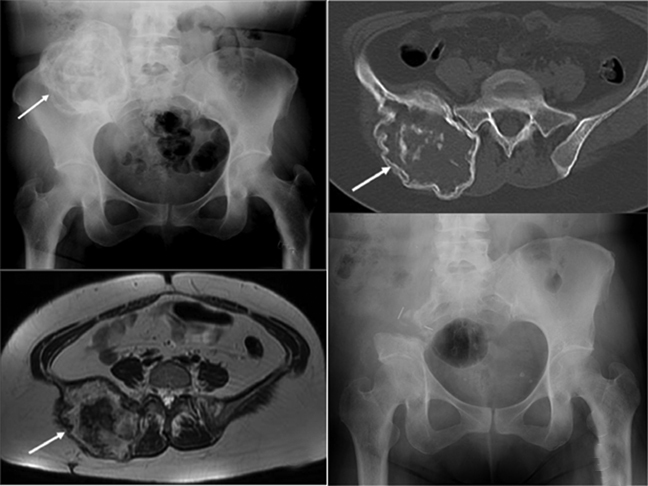 Functional results and quality of life after treatment of pelvic sarcomas involving the acetabulum. J Bone Joint Surg. 2006;88:575-582. PubMed PMID: 16510825.
Review of hemipelvectomy endoprostheses: Indications and imaging findings. Appl Radiol.